This alternative heating method (which absorbs heat from the outside air to heat radiators, under-floor heating systems, or warm air convectors and hot water in your home or business premises) could be the ideal solution if you want to generate your own heat and save money on your energy bills. Air Source Heat Pumps (ASHPs) enable the transfer of heat from one space to another, generally from outside the home to inside. Sourcing heat from the atmosphere the pump is able to provide heating to both hot water and indoor space. Although ASHPs run on electricity they generate significantly less CO2 than conventional heating systems, making them one of renewable energy’s most efficient commodities. Air is a renewable heat source and although the pumps will not completely eradicate a carbon footprint, the low carbon technology will certainly go a long way to lessening environmental impact. For every unit of electricity used by the pump, between two and three units of heat are generated, which is why ASHP installation qualifies businesses for financial reward under the government’s Renewable Heat Incentive (RHI) – launched in April 2014. As an alternative heating solution, ASHPs are not only an ethical option but can be cost effective too. The technology used by ASHPs is similar to that of an air conditioner or refrigerator but it works in reverse; warming instead of cooling. Typically the pumps consist of an evaporator, a compressor and a condenser. Situated outside the building, the pumps absorb heat from the air and transfer it to the refrigerant. The refrigerant is then passed through a heat exchanger and then transferred to the radiators, underfloor heating systems or warm air convectors, which then heat the property. The air-to-air system releases warm air, which is fed into a building through fans. This type of pump is commonly used for space rather than hot water. An air-to-air heat pump can absorb heat from air that’s as cold as -15°C. The air-to-water system releases heat via a wet heating system, providing warmth at lower temperatures for longer periods of time. This type of pump is best suited to underfloor heating systems, warm air heating or convectors. As far as maintenance goes, ASHPs require very little; a yearly check by the owner and a more detailed check by a professional installer every three to five years should be sufficient. Generating less CO2 than traditional pumps, ASHPs are the ethical option when it comes to environmental impact. ASHPs fall under the Renewable Heat Incentive (RHI), qualifying businesses for grants and payments, as well as the Green Deal, which finances energy-efficiency improvements to heating systems. Some ASHPs multitask as air conditioning units in summer. Some ASHPs provide space heating as well as hot water. Some ASHPs feature advanced air purification technology, which is particularly beneficial to allergy sufferers. ASHPs are easy to install; as far as property modification is concerned, the pumps require very little. If you’d like further information on Air Source Heat Pumps, feel free to contact the CH Systems team on 0208 302 8149 or info@chsystems.cc. 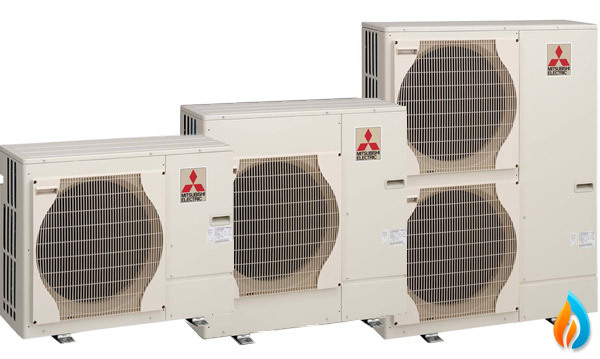 Boasting one of the most advanced, efficient heating systems available today, Mitsubishi Electric’s Ecodan Heat Pump range is CH Systems’ preferred choice when it comes to supplying technology that offers improved energy efficiency and meets tough legislation.